If you’re a new user, it’s easy to become overwhelmed by all of the QuickBooks terms that you will encounter throughout the platform. Especially if you’re also new to the world of business accounting. But don’t worry. Below is a list of QuickBooks definitions that every user should know to the most commonly used terms. It’s worth being familiar with these Quickbooks definitions when talking to your accountant or QuickBooks tech support. This is QuickBooks Online. And it is usually pronounced Q-B-O. QBO is the subscription and the actual data file. This Quickbooks definition is an acronym for QuickBooks Online Accountant. Also a QBO subscription, and really, QBOA is a QBO Plus file with an accountant skin wrapped around it. Small business owners do not use QBOA, as that is really for the accounting firm and staff to manage their work and their QBO clients. I do hear QBO and QBOA used interchangeably, but that is confusing and wrong. QBOA is the portal the firm uses to access their client QBO files, whereas QBO is the client file. Your Intuit ID is most likely the email address you use to log into your QBO or QBOA company. The user ID (Intuit ID) can be an email address or some abbreviation you choose that is linked to the email address. 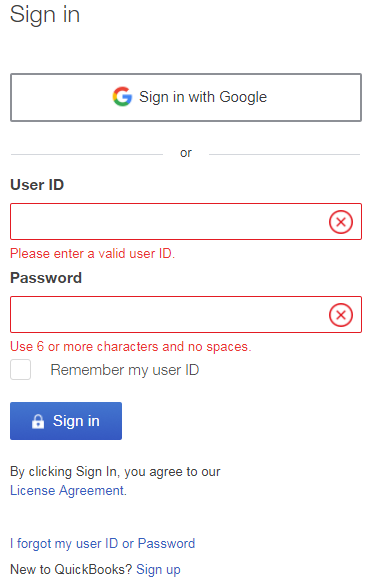 For example, qbouser@gmail.com is, in fact, a user ID that logs into QBO (with a password) but also is considered an Intuit ID as it is a user that logs into a product.intuit.com. But I also have a user ID of qbouser, just by itself. That gets me into qbo.intuit.com too and is linked to my email address of qbouser@gmail.com. Best practice is to just use your email address as the user ID that logs you into QBO, a.k.a. your Intuit ID. Some refer to this Quickbooks definition as Gear or Tools. I’ve even heard it referred to as Sprocket. The Gear Icon con is one of the icons at top right of QuickBooks Online, and it does, in fact, look like a sprocket. The Gear icon is where all operational features reside, making it an essential part of learning how to use QuickBooks Online. From here you can Manage Users, Accounts and Settings, Attachments, Recurring Transactions, Budget (if you are a QuickBooks Online Plus subscriber), User Profiles, and more. The access point for the Account & Settings is under the Gear Icon. 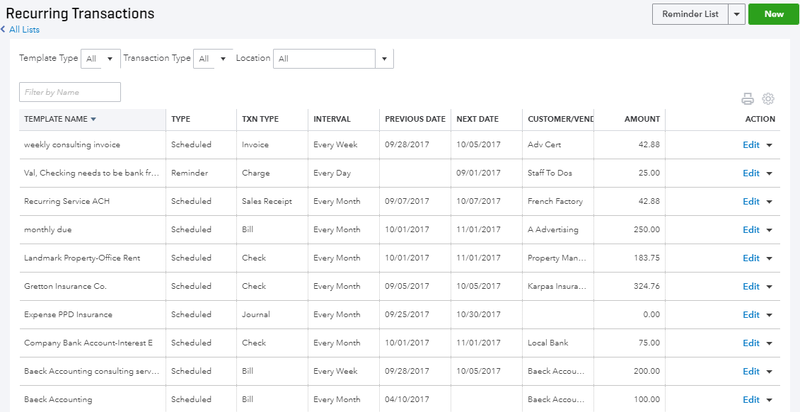 Here you can turn some features on and off, as well as enter some company info like entity type, tax form type, as well as accounting settings like close date, start of fiscal year, etc. 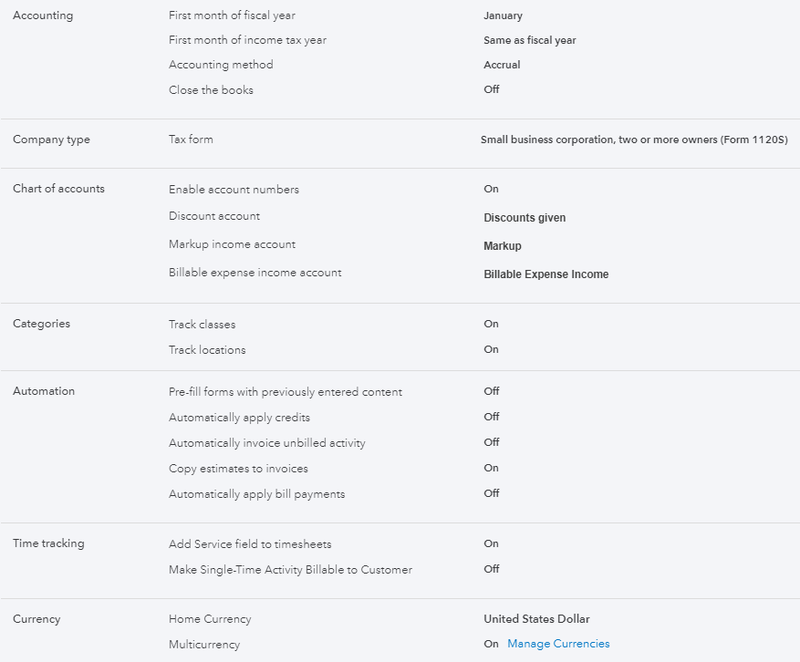 Account & Settings has a lot of advanced type options too like invoice automation, inventory (for Quickbooks Plus subscribers), class/location tracking (Plus), and multi-currency. The Advanced tab in Account & Settings holds a lot of the hidden gems of what QuickBooks Online (mostly Plus) can do. Below is a screenshot of the sub-sections of that tab, and it is always an important QuickBooks Online setup step to click through each Advanced setting to at least know the feature is there for the day you’re ready to activate it. Also accessed from the Gear Icon, this page is critical. 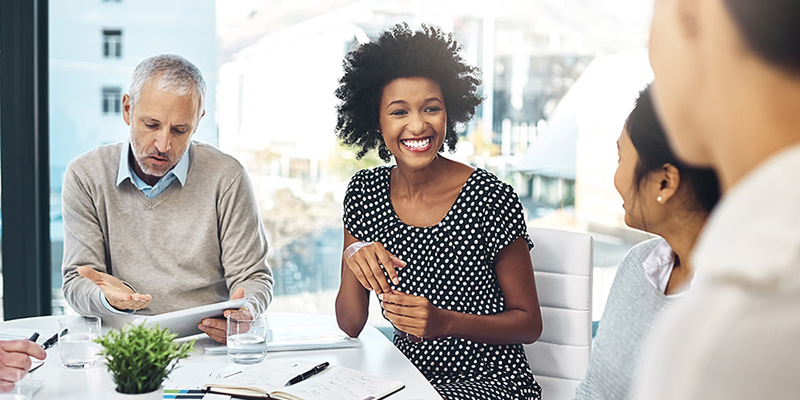 This is where you invite your accountant and your colleagues that will have access to the QBO file. Manage Users is split into two sections—Manage Users, which is the business users that will access the file, and Accounting Firms. Your business accountant will give you the email address to invite in that section, and that is how the firm accesses your file. The QuickBooks definition of chart of accounts is a complete listing of each account in a business’s accounting system. QuickBooks Online supports all the typical account types any accountant would want: Assets, Liabilities, Equity, Income, Expense—all the major players are in here. These accounts allow your Balance Sheet and Profit & Loss to exist. When you sell or purchase things, money is moved from one account to another, and the magic is it all balances. Something is debited, something credited, something gained, another lost. Ask your accountant for more info, but the T-chart starts and stops here. This is accessed from the Account tab in the Left Nav Bar or from the Gear icon. 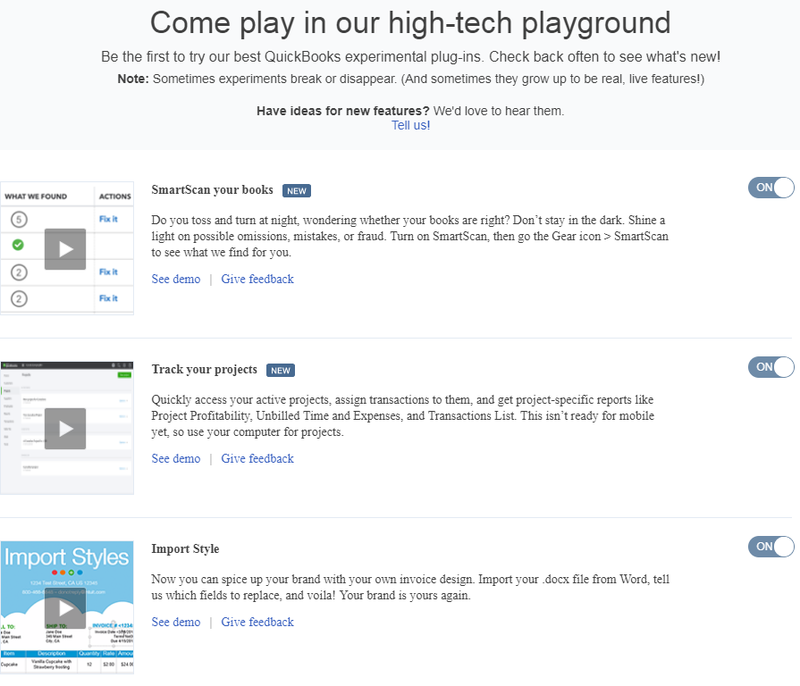 Accessed from the Gear Icon, QuickBooks Labs is a Beta playground. It showcases a few features QuickBooks is considering adding to QuickBooks Online at large but want feedback for first. This is a critical Quickbooks definition on our list of terms. When you sell to a customer who will pay you later, you create an Invoice. On an accrual basis, the income shows on the profit & loss (P&L) statement, even though you might not have received the actual payment yet. On a cash basis P&L, the income will not show till the payment is received against the invoice. Same on the other side of the fence—you purchase a product or service from a vendor, and you will pay them later using a Bill. Same story re: accrual/cash basis on reports. I know most of you run your business on a cash basis, so it is important to know how Invoice/Bill behaves on a cash basis P&L. Note: Do not use an invoice or bill if you receive/pay the money right away. Instead, use a Sales Receipt on customer/income side, and a check, expense, or credit card charge on cost side. Accessed from many areas, the “+” sign at top right is quickest. 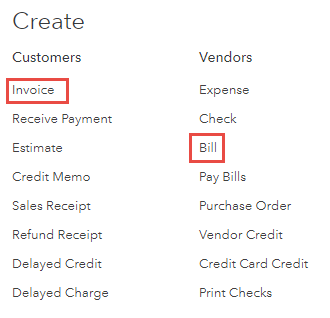 Bottom line: In regards to specific QuickBooks definitions: Invoice = Customer Transaction and Bill = Vendor Transaction. Sometimes you want QuickBooks Online to create transactions at a certain frequency for you so you don’t have to do them manually each time. Like a recurring check for rent, a bill for utilities, or a sales receipt for a monthly customer payment. 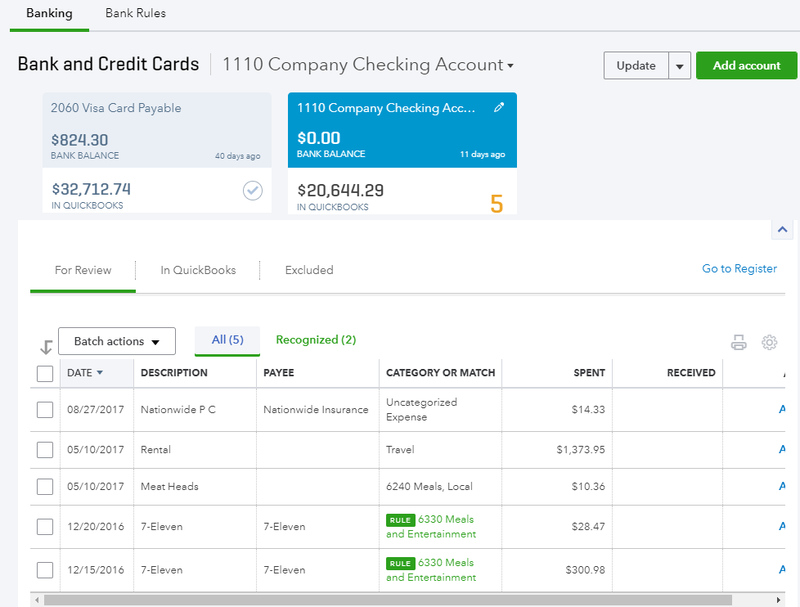 Nearly all transaction types in QuickBooks Online can be set to recur, save for a paycheck, a bill payment, and a customer payment against an invoice. All other transactions are fair game to repeat if you choose. The Recurring transactions list is found under the Gear Icon, and some use it to set Reminders too. Got some examples below…. Tip: If you have QB Payments active, you can set up recurring sales receipts to auto-draft customer bank accounts. Under the Gear Icon is the Attachments list. In QBO Essentials and Plus, you can attach docs to transactions and customers/vendors. You can even take a photo of a receipt on the QBO mobile app, which creates an expense transaction in QBO with the receipt attached. These days, if there is no attachment it is like it never happened. There is no top cap of attachments, the cap is at the transaction or list level (customer/vendor) and is 25MB per. This absolutely should be done monthly. 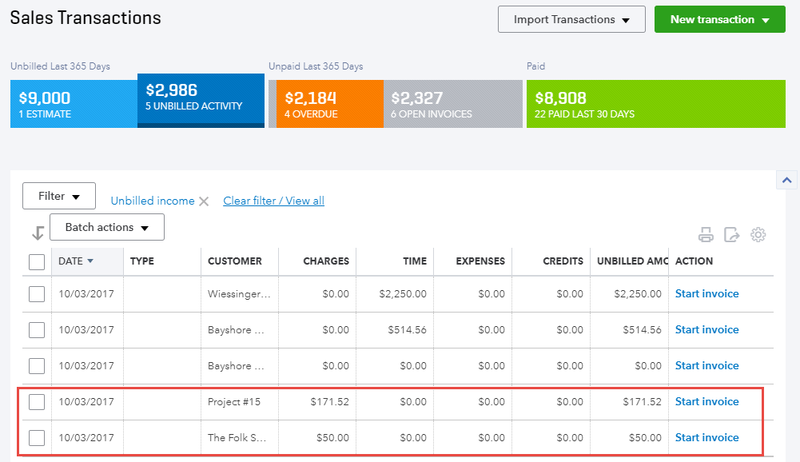 This is where you or your accountant will match the bank statement from last month to what is inside of QuickBooks Online for that same period. And it must match! It is another backbone of accounting, along with the chart of accounts, products and services, and customers and vendors. It just needs to be done. The Reconcile module is accessed either from Gear icon or from the Accounting tab in the Left Nav Bar. If you don’t know how to reconcile in QuickBooks Online, definitely leverage a ProAdvisor in your area and one that is adept at QuickBooks Online. One of our favorite reports in QuickBooks Online. You can see when a user logged in and out and what they did while they were in QBO. You can also filter for a particular user and specific event. Mostly, the log tracks transaction events. 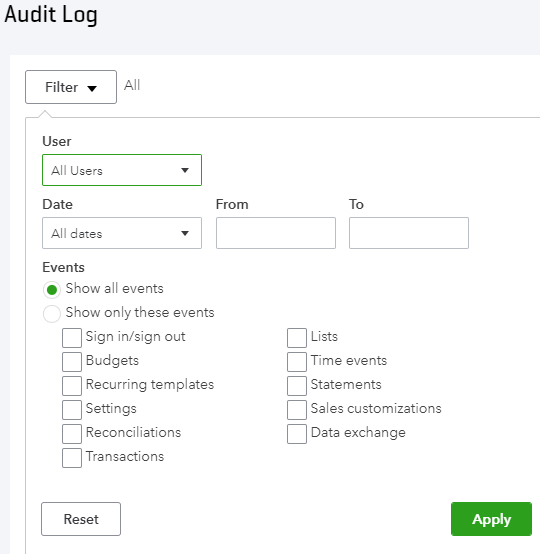 Only All users, Company admins and the Master Admin, of course, can view the Audit Log, so it is a great report for tracking what limited users are doing—not for fraud purposes but for QuickBooks training opportunities. We have referred to it above several times, or as we like to call it, the left-hand panel. Dashboard, Banking, Sales, Expenses, Employees, Reports, Taxes, Accounting, My Accountant, and Apps. In the world of QuickBooks definitions, your QuickBooks Online homepage is referred to as your dashboard. A few charts and graphs, bank feed connections, reminders, and tips. You see it every day first when you log into your QuickBooks Online file. Here’s another main backbone of QuickBooks, and really any accounting software. Reports are great, and mostly the end game, but how do you get the data there fastest? 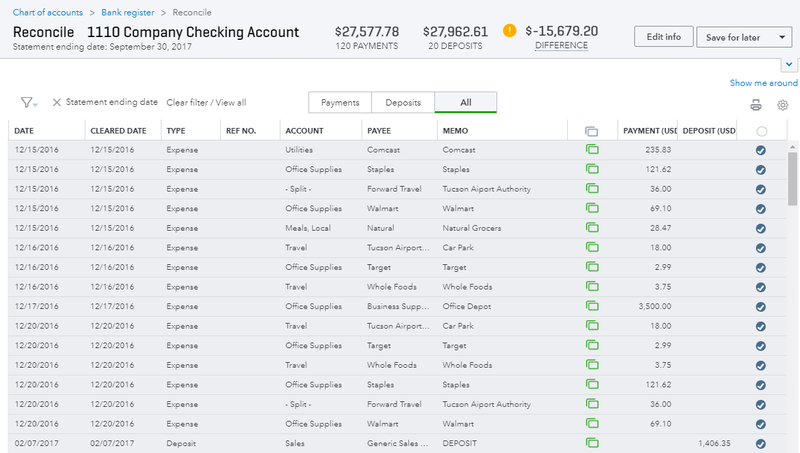 Connect your checking account and credit card account to QuickBooks Online, and everything that was cleared the day before will show up in your feed. You can then add to register or set up rules to help auto-categorize and choose proper Payee. There is even a setting in the rule that will automatically add to register. Automation of data entry is where it’s at, and bank feeds are your way to get there. You can access your feeds from the homepage at the far right or from the Banking tab in the Left Nav Bar. In terms of QuickBooks definitions, QBOP stands for QuickBooks Online Payroll, the payroll module that lives inside of QuickBooks Online. This acronym stands for QuickBooks Online Full Service Payroll— it is the payroll module that also lives inside of QuickBooks Online. Intuit handles all the payments and form filing for your business taxes. 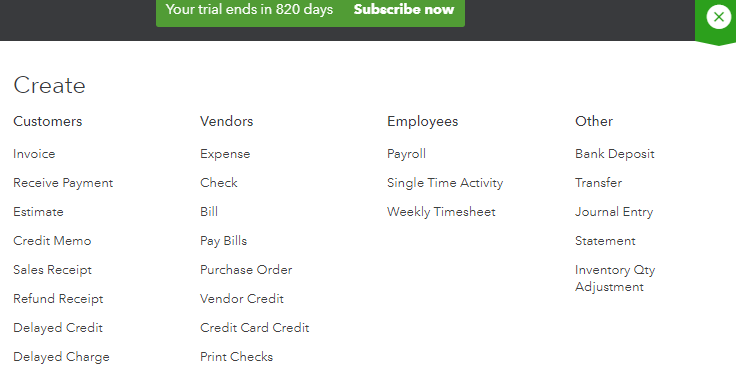 The “spinny” plus sign at top right of QuickBooks Online is where all transactions are accessed. A non-posting sales transaction that holds the charge for the service until you want to invoice against it. Some might use this in place of a Sales order, though QuickBooks Online does not track current availability. The form is found under Quick Create. 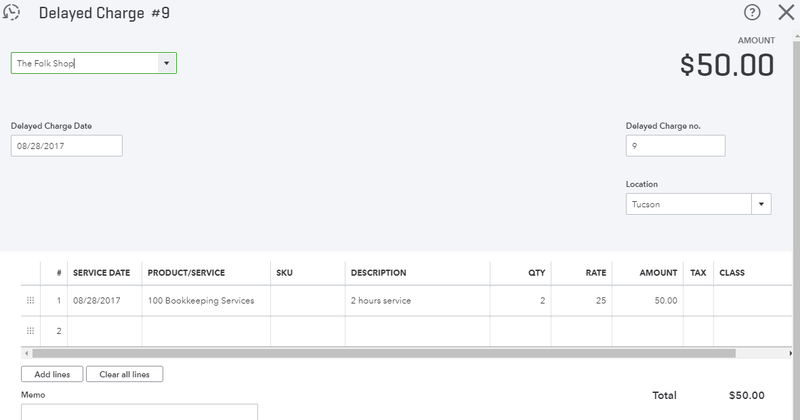 You can create invoices against them too and there is even a setting that will do that automatically at a certain frequency in Account & Settings. This Quickbooks definition is maybe the simplest of the bunch—it stands for QuickBooks Desktop. There you have it, the list of top QuickBooks definitions you need to know. This, of course, is in no way an all-encompassing list, but this list of QuickBooks definitions will certainly get you familiar with the platform.